I am thrilled to have another wonderful guest post by another favorite blogger of mine. Ashley from Life with Moore Babies, always inspires me to find an activity to bring to life a book. She is so creative and purposeful about not just reading with her babies, but showing them how to bring those words to life. Ashley is sharing with us today a great candy recipe that was inspired by a classic - I hope you all enjoy! After Bria accepted a small part as Carrie Ingalls in a homeschool skit, we immediately started reading the Little House series. Of course we started with Little House in the Big Woods, and I was amazed at how interested the girls were in the book! Even though they are young (4 and 5), they loved it! 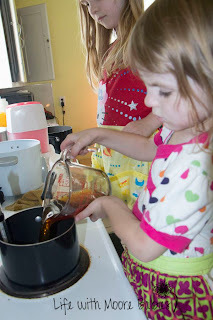 After reading the chapters about the Sugar Snow and the Party, we decided to try and make our own Maple Candy! I found this recipe at Laura's Prairie House , and while it isn't difficult, it does take a long time! It was hard for the girls to be patient. Luckily, they got to help stir, and we were also able to read more of the book! They also sneaked more then a few tastes of the maple syrup! 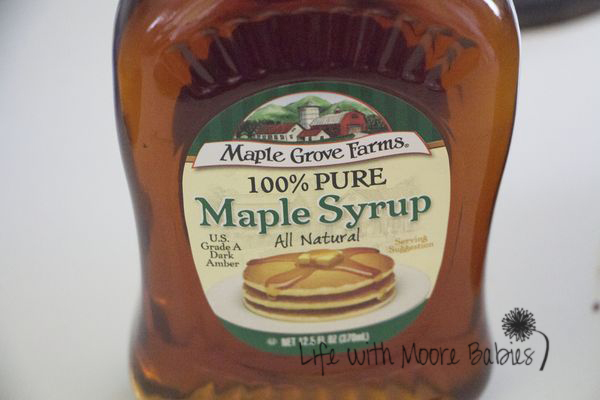 Remove the syrup from the heat and allow to cool to 110 degrees. At this point you will add 1 teaspoon of vanilla extract (probably don't have to include, but I'm not a big maple fan), and heat over low stirring until the mixture is smooth and fluffy. 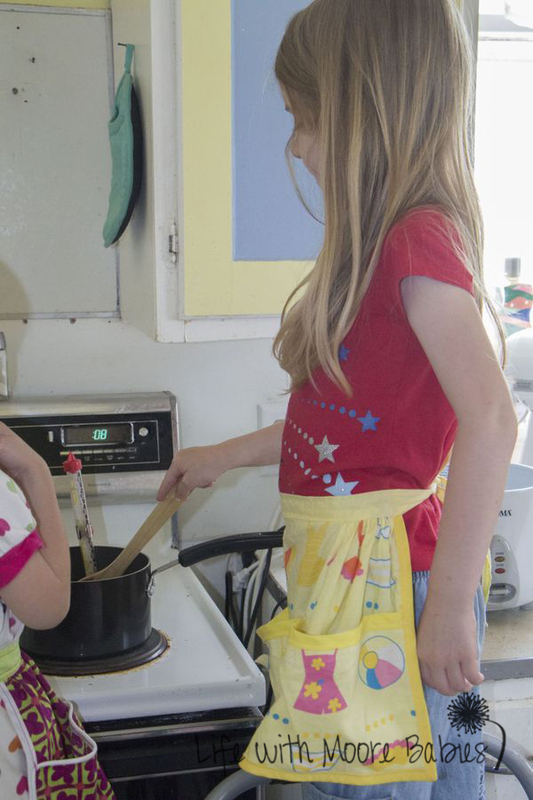 To be honest the girls were a bit impatient by this point, so I am not sure we cooked ours long enough. It was smooth, but I wouldn't have called it fluffy! 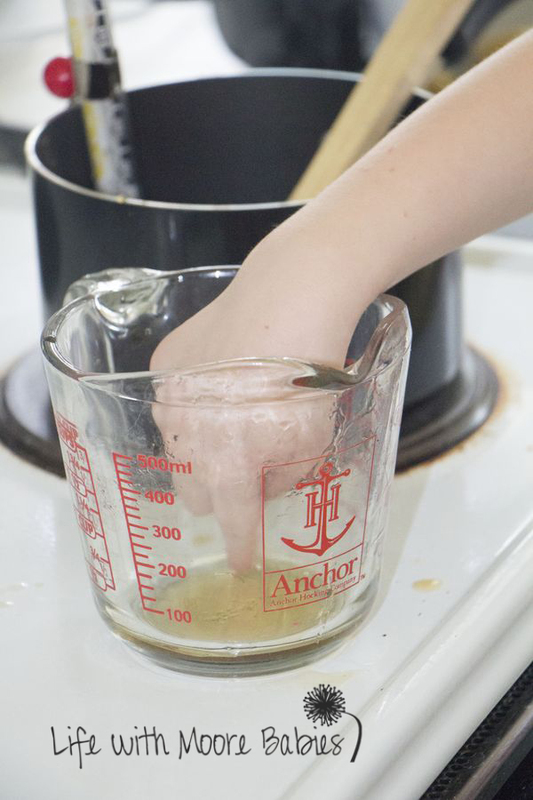 Once it is ready you can place it in individual cups (mini muffin tins would work well), or you can pour it onto clean snow like Laura did in the book. The girls really thought putting the candy on snow to harden seemed fun, so we crushed up some ice to pour ours on. The finer the crush the more even your candy will be. 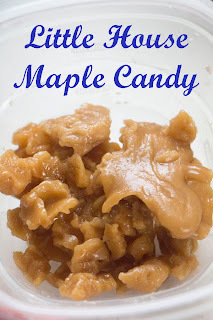 A minute later you have Maple Candy! 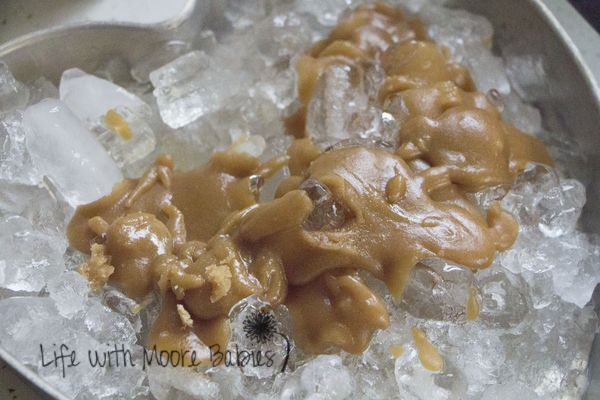 Once the candy is hardened you can remove it from the ice. Our ice was still pretty coarse, so the candy wasn't even and broke into several different sized pieces. Time for a taste test! The girls really liked the Maple Candy, and even I thought it was pretty good. It was surprising to me that it really didn't taste like the maple syrup I am used to; it was much more like a brown sugar. And it wasn't hard either! 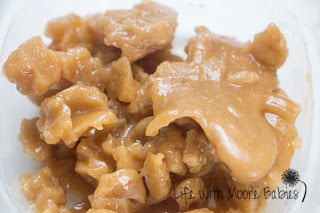 This Maple Candy recipe was definitely a great little extra to go along with the book as well as an exercise in patience! 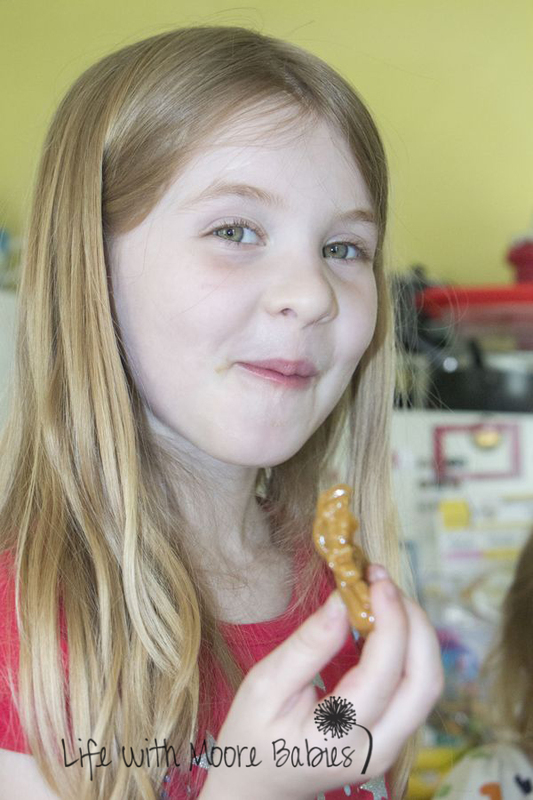 My girls really enjoyed doing something Laura did, as well as the tasty results, so I would say the time was well worth it! A classic strong-willed child, Ashley, fulfilled her lifelong dream of becoming a veterinarian in 2005; only to realize a new dream had formed, having a family with her husband (another strong-willed child). After much heartache, they were blessed with two daughters and a son, who are all proving to be just as spirited as their parents! Though she is still working part-time, she fills her days off with fun activities and lots of learning with her three kids. And this is where the blog comes in. 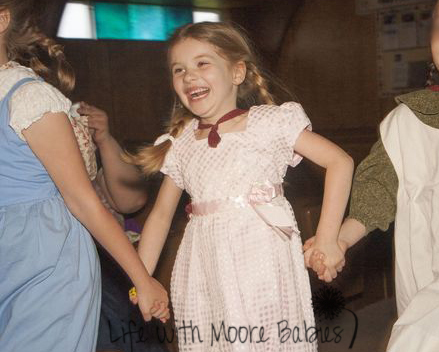 Life with Moore Babies is where she documents the activities they do and the places they go in hopes that someone might be inspired to do some "fun learning" with their kids. You can find Ashley on Facebook, Pinterest, Google +, and Twitter.